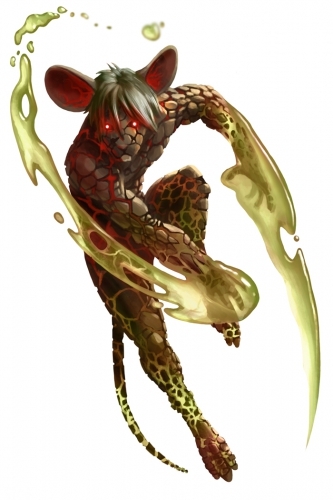 The Outbreak Assassin Mouse is a breed of mouse found in the Toxic Spill, for hunters of rank Duke/Duchess and above. Cracked and corrupted, the Outbreak Assassin Mouse has obtained the ability to control the state of sludge while he is in contact with it. Abandoning conventional weaponry for his own vorpal blades, this mouse makes a weapon out of his own body and the environment. Like others in the area, they will stop at nothing to preserve their new-found power. Outbreak Assassin mice are especially attracted to Rancid Radioactive Blue cheese, to the point that any other kind of cheese will simply not suffice. Hydro type traps such as Oasis Water Node Trap or Phantasmic Oasis Trap are effective against the Outbreak Assassin Mouse. The Outbreak Assassin Mouse drops the Toxic Spill Egg during the annual Spring Egg Hunt. This page was last edited on 18 September 2014, at 21:10.